On March 29, Ullu, a popular streaming platform, is all set to engage you with yet another series, Halala, showcasing the issues stemming post Triple Talaq faced by women in the Muslim communities. Halala is presented by Ullu, helmed by Producer-Filmmaker-Entrepreneur VibhuAgarwal, in association with Falguni Shah’s Dreamzz Images Studio and is directed by Deepak Pandey. 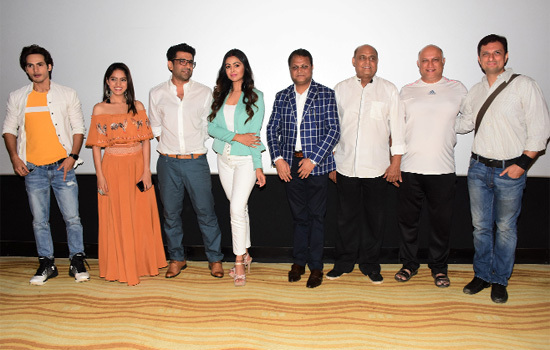 LalitPandit graced the unveiling as the Chief Guest amongst actors Eijaz Khan, ShafaqNaaz, Deepika Singh, YatinKaryekar, PrithviZutshi, Ravi Bhatia, RushadRana, Presenters VibhuAgarwal and Falguni Shah and Director Deepak Pandey. After IshqSubhan Allah turning out to be one of the most popular television shows, PhirUsi Mod Par, Code Blue and a new wave of nationally and internationally acclaimed films and series throwing light on the plight of Muslim women in the country, around Asia, also including the Muslim dominated regions, Halala showcases the issues arising after a Muslim woman has been given Triple Talaq. After the pronouncement of talaq thrice, the woman is deemed haram i.e. unlawful, and is therefore prohibited for the husband. And not just this, the barbarous practice of NikahHalala is an Islamic Law requiring a woman to marry and sleep with another man in order to return to her first husband! Revolving around a couple’s compromise on love, a fearless woman’s journey and the fight within her and the society, Halala’s casting was an intricate process that concluded with veteran and the young talent alike, all set to portray their acting skills, all over again, on the new medium and thriving platform. Ullu’sHalala has a stellar cast of Deepika Singh of DiyaAurBati Hum fame, Ravi Bhatia known for his stint in Jodha Akbar, ChidiaGhar’sShafaqNaaz and Eijaz Khan of YehMohMohKeDhaagey fame. Saving the best for the last, Ullu’sHalala has the popular and talented actress-dancer NeelimaAzeem who essays the role of a mother in the show, Shafaq is set to play the show’s lead while Ravi and Eijaz will play her husbands and Deepika will portray the role of a lawyer in the awaited series.